If you have any questions about the SALUTE information page below please contact us. This sailing yacht SALUTE is a 56 m 184 (foot) impressive aluminium ship which was at Perini Navi and devised in the office of Perini Navi and Ron Holland Design. The large cutter sloop SALUTE is a very well designed Italian built superyacht which was launched to accolade in 2008. The naval architect responsible for this yacht's plans and general arrangement with respect to this ship is Perini Navi and Ron Holland Design. In addition, the interior design was from the company Remi Tessier / Ron Holland Design. She could be described as a recent cutter sloop. Perini Navi was the naval architecture company involved in the technical nautical composition for SALUTE. Her interior design was conceived by Remi Tessier / Ron Holland Design. 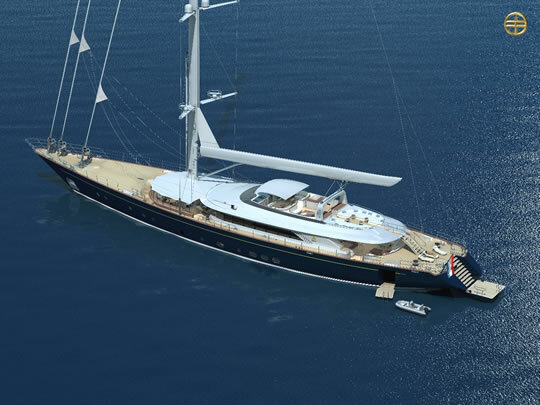 Perini Navi and Ron Holland Design is also associated with the yacht wider design collaboration for this boat. In 2008 she was formally launched to accolade in Viareggio and following sea trials and detailing was afterwards delivered to the owner who commissioned her. Perini Navi completed their new build sailing yacht in Italy. Her main hull was built out of aluminium. The sailing yacht superstructure component is fabricated largely with aluminium. With a width of 11.52 m / 38 ft SALUTE has spacious size. A 9.83 (32 ft) draught of 9.83m (32ft) affects the amount of overall harbours she can visit, contingent on their individual characteristics. Installed with twin MTU diesel engines, SALUTE will reach a maximum speed of 15.6 knots. Connected to her MTU engine(s) are twin screw propellers. She also has an efficient range of 3600 miles when sailing at her cruise speed of 13 knots. Her total HP is 1930 HP and her total Kilowatts are 1440. The sizeable luxury yacht sailing yacht SALUTE can sleep up to 10 passengers and 8 crew. 56 metres / 184 feet. Giving the combined power of 1930 HP /1440 KW. 15.6 nautical miles per hour. Range in nautical Miles is 3600 at a speed of 13 knots. 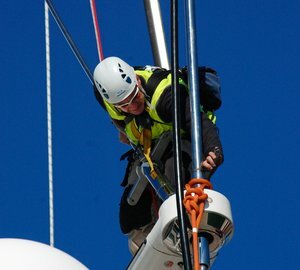 In Sept 2009 SALUTE cruised to Cannes, in France. SALUTE also traveled the location near Département des Alpes-Maritimes during the month of October 2009. The luxury yacht SALUTE displayed on this page is merely informational and she is not necessarily available for yacht charter or for sale, nor is she represented or marketed in anyway by CharterWorld. This web page and the superyacht information contained herein is not contractual. All yacht specifications and informations are displayed in good faith but CharterWorld does not warrant or assume any legal liability or responsibility for the current accuracy, completeness, validity, or usefulness of any superyacht information and/or images displayed. All boat information is subject to change without prior notice and may not be current.